My poem “My Ex’s Father” now appears in the April 2019 edition of Foliate Oak Literary Magazine, an online journal published by University of Arkansas-Monticello. It’s an older poem that I recently unburied and revised, and to me the poem speaks to the idea that when we break up with someone, the greatest loss isn't always that person, but the others we no longer get to call a part of our circle. My Ex’s Father” will also appear in my upcoming poetry collection titled Feral Kingdom (from Kung Fu Treachery Press, date TBD) alongside other similar pieces, and I will post more details as soon as the book is available. Thanks for taking a look, and I appreciate all of your support over the years. 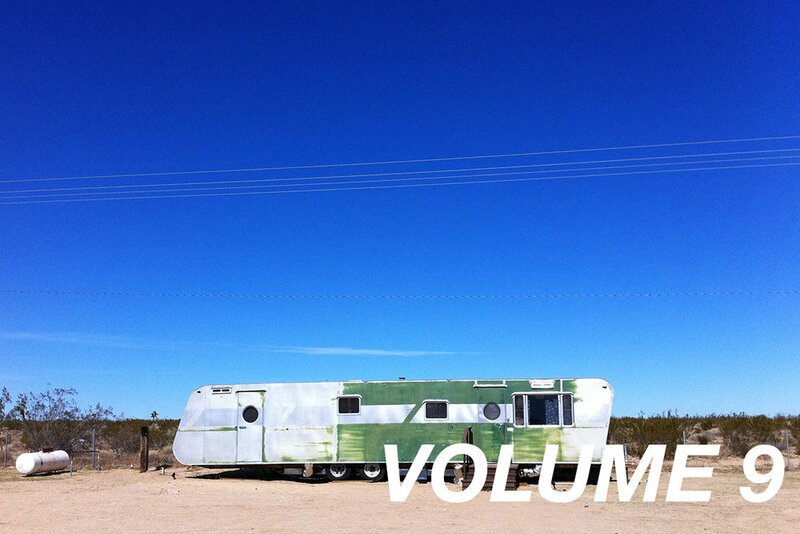 My poem “an unordered list of things that remain” is now up in Trailer Park Quarterly, Volume 9, a magazine I’m very fortunate to have appeared in before now and I’m extremely honored to be in there again. The issue features a bunch of other writers I respect, such as John Dorsey, Tobi Alfier, Kevin Ridgeway, Jason Ryberg, Wendy Rainey, and many others. This particular poem is about the passing of our family dog, Rocky, and it means a lot to me. I hope you enjoy it. The September 2018 issue of Ghost City Review (a publication of Ghost City Press) is now live and includes my poem "Hidden By The Smell of Flowers" alongside the work of such writers as Kate Garrett, Peycho Kanev, Emma Lee, Kristin Garth, and others. The issue includes poems, an interview, and a drama/play. My thanks to the editors for including my poem, and I hope you enjoy! I'm ecstatic to announce that two of my poems now appear in an amazing collection, The Blue Hour Anthology, Vol. 4. This press has supported my work for a long time and to have my poems "Badlands" and "Sunday May" in their new assemblage is a real honor. They always put out gorgeous books and they have a great eye for writing. Being included with such writers as John Dorsey, Megan Gray, Heather Minette, Allie Marini, and Johnathon Dowdle (among many others) proves it. My deepest thanks goes out to the editors for including my work, and you can pick up copies at their Etsy shop! One of my favorite online literary journals, Lonesome October Lit, has published my poem "Long Before Twilight," which contains all sorta of fun nostalgic references to my grade school library, books about werewolves, and childhood daydreaming. The poem also appears in my narrative poetry collection We Are All Terminal But This Exit Is Mine, which is available at Amazon. Be sure to read the other eerie, spooky poems and stories over at Lonesome October Lit too, and let me know what you think! Thanks for reading. It's always a good feeling to find yourself in one of your hometown lit magazines, and Up The River: A Journal of Poetry, Art, & Photography is a gorgeous literary web-zine hosted by Albany Poets, an organization promoting events and writers in the Albany, NY area. My poem "Spiders at Night" appears in Up The River, Issue Six, alongside the work of other poets I really enjoy, like Kevin Ridgeway, Alan Catlin, and others. Check out the poem and scroll the through the other issues for a lot of excellent poetry. Thanks! Two of my poems recently appeared at Winedrunk Sidewalk, an online daily poetry journal that also subtitles itself "Shipwrecked in Trumpland," and focuses on anti-authority, political, and working class poems. These two, "Lo Cool, 69 Degrees" and "Soft White Infinity" certainly fall along those lines. I hope you enjoy. 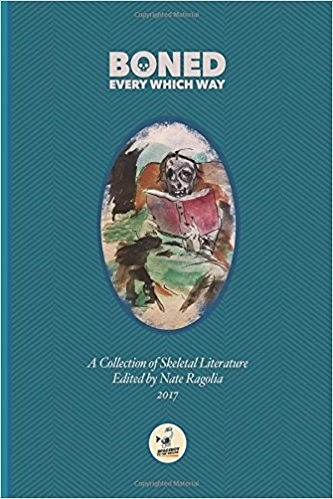 BONED Every Which Way 2017 is an anthology of the poems that appeared at the BONED online magazine over the course of the year, and the new paperback edition includes two of my poems, "Dry Tide" and "Going Ghost." The first poem, "Dry Tide," first appeared in my mini-chapbook The Darkest Bomb from the Lantern Lit, Vol. 1 collection, which is also available online. The second, "Going Ghost," takes me back to my days in Berlin, Germany almost eight years ago. Feels like yesterday. Anyway, the collection is full of great poets, including Mikey Sivak, Wanda Marrow Clevenger, Susie Sweetland Garay, RM Engelhardt, Matthew Borczon, Mat Gould, and others. The anthology is also edited by Nate Ragolia, who is a fine poet himself. I hope you are able to pick up a copy, it's pretty darn affordable at just under $12. Enjoy! My new poem, "The Guest Room Closet," now appears at Lonesome October Lit, one of my favorite online publications. As they say at their website, Lonesome October Lit "is a horror webzine for poetry as well as short fiction. 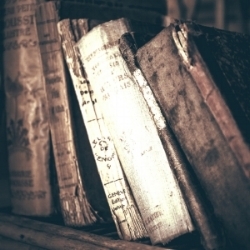 The founding editor felt there was a lack of space out there for horror poems in a market flooded with mainstream literary venues and homes for genre prose fiction." If you love spooky, scary, atmospheric poetry and short fiction, this is the place for you. My poem is about an eerie childhood visit to a small village in the Hudson Valley, where something dark waits for a wayward guest. I hope you enjoy! Two new pieces that relate to driving along the more remote and nostalgic stretches of highway are now posted at the Punch Drunk Press website. My narrative poem "West Texas Skyway" concerns a memory of driving out to Ft. Davis and Alpine with my father and sister, and my poem "We'll Take a Trip to See" concerns memories of returning to a small town long after leaving a life and relationship behind, many years prior. I hope you enjoy, and many thanks to the editors at Punch Drunk Press for including my work at their website! I recently had the privilege to be part of Up The Staircase Quarterly's 10th Anniversary celebration, in which April Michelle Bratten, longtime editor of the incredible magazine, asked me to help select one of the best pieces over the last 10 years. Since one of my own poems appeared in UTSQ in 2011, she asked that I scour that year for a choice poem, and I selected "waking//daydream//or I MAY JUST CEASE TO EXIST:" by Faith Mingus. It's an excellent poem about her truest self, an existence of choice, a reality running counter to her day-to-day life. I highly recommend not just this piece, but the entire issue, which is full of other great selections, poets, and reviews! And keep submitting your own work to UTSQ, which I hope will be going strong for another ten years and far beyond! One of my favorite literary and cultural magazines online, Drunk Monkeys, just named my latest collection We Are All Terminal But This Exit Is Mine as their pick for the Best Book of 2017. It's a massive honor and I'm blown away by the response, especially from a group of editors and writers I already deeply respected. In their post, they said, "It’s a powerful, transformative, and funny work - and our choice for Best Book of 2017. ...no book moved us, challenged us, and inspired us like James Duncan’s poetry collection We Are All Terminal But This Exit is Mine." Check out their website for the entire review. As always, I owe a lot to Bud Smith at Unknown Press for working with me on the book and for pushing me in new directions. And thank all of you for reading the book (signed copies are still available!) and for supporting me over the years. Kleft Jaw #11 just blew a hole in the internet with their 11th issue, and I'm grateful to have two pieces within, a poem titled "Lo Cool, 69 Degrees" and a flash fiction story called "$10,000" which used to be a poem I originally wrote in Colorado but I fleshed it out to an actual story because it needed more room to detail the weird encounter I had with a man in a coffee shop out in Ft. Collins a few years back. You can read these pieces in the online magazine, and please check out the other work and art in the issue. It's a wild collective over there and I'm always pumped to be included in some Kleft Jaw chaos. 2017: The Year of Finishing Something...Anything! My 2017 writing life started by trying to revise a novel I had worked on for almost a decade, before deciding around March that it just wasn’t working. Plot holes kept shifting, twists I added to make the story unique only made other part of the story implausible, and I kept blending too many genres to the point where I didn’t know if the story was taking place in the past, present, or future, if it was a dystopian story or a noir or both or neither. I admit, I was making it too hard on myself, too complex, but I had lost the clear vision needed to simplify that story. I was in too deep and it just wasn’t working out. I love the characters so damn much, but I decided to stop for good (or...for now?) and pursue other projects I wanted to work on. Earlier this year, the editors over at Cahoodaloodaling asked if I would join them as a guest editor for one of their issues, and I jumped at the chance. They also allowed me to suggest a theme. It was a huge honor being asked, and right away I knew I wanted to edit an issue based on the idea of solitude. Solitude is a major theme in my life, both as a comforting thing and as the sometimes lonely side effect of being a writer in need of quiet time in order to work. It can be good and bad, and for others, it can be a relief or a tragedy, something to embrace or to fear. It means so much to so many, and in this issue we capture a lot of that, covering an array of feelings about solitude and what it means, in an issue we titled Solitude's Spectrum. Though we read blind submissions, there are a lot of writers I know and respect in this issue, including Megan Merchant (who wrote our spotlight piece "of use," Rebecca Schumejda, Bridget Clawson, Shanti Weiland, and many more, as well as an interview with another favorite poet/editor, April Michelle Bratten. My deepest thanks goes out to Raquel, Rachel, Hannah, and all the other editors and readers at Cahoodaloodaling for letting me join the team, if only for a little while. And thank you as well for taking a look at the issue, my interview within with Rachel Nix, and at everything else Cahoodaloodaling offers at their site. Enjoy! My poem "September in the Attic" now appears (on page 31) in the new issue of Free Lit Magazine, which has a unique "Magic" theme, and climbing into one's attic in early fall can certainly become a magical adventure full of nostalgia and daydreaming, something I explore in this poem. You can read the issue online or download a PDF, and I hope you'll consider sending them your own work. My thanks to the editors for including me, and my thanks to you for reading. 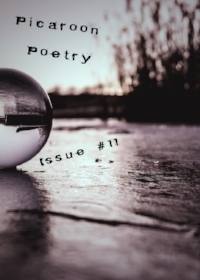 My poem "The Mice Have Abandoned The Woodpile" is now featured in the new issue of Picaroon Poetry (it's on page 7), edited by the talented poet-pirate and sea-witch extraordinaire Kate Garrett. The collection features a slew of excellent poets, including Jessica Mehta, Ali Jones, Emma Lee, Spangle McQueen, Russell Jones, and many others. The poem is perfect for this early winter season, as it was written in November one year ago and speaks to themes of oncoming winter, loneliness, and what happens as you attempt to move on from a failed relationship. You can read the issue online, so I hope you take a look, enjoy, and send Picaroon your own bounty of poetry. Thanks! My poem "The Green Carpet," which also appears in my new book from Unknown Press, We Are All Terminal But This Exit Is Mine, is now featured over at Words Dance Publishing, a fantastic site that posts all kinds of great literary content. The poem looks back on my fond childhood memories of my elementary school library and how formative that place became, and all the feelings that can overcome you later in life when you realize those warm, wonderful places feel so far behind you that you'll never be able to reach them again. It's a good example of the kind of work you'll find in my book, which is available at Amazon or by contacting me at jhdwriting@hotmail.com. My deepest thanks to Amanda Oaks for accepting the piece over at Words Dance. Definitely check out their site! And thank you for reading. Things have been rolling this week. On top of my new book dropping Halloween night, I have three new poems appearing in three different magazines around the net. 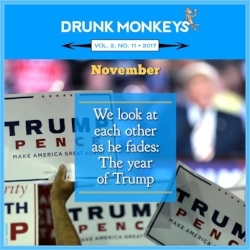 My poem "Hunger" joins a slew of others in a special edition of Drunk Monkeys: The Year of Trump, a collection of poems, prose, interviews, and art about life in this "new normal" that shouldn't be normal at all. 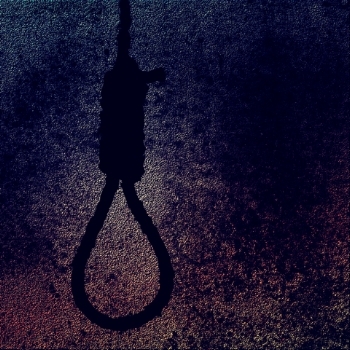 The writers here are no fan of 45, and my pieces laments over how to deal with loved ones who have gone lockstep in a strange and frightening direction. The issue is full of wonderful writers, like Rachel Nix (Hobo Camp Review's new associate editor! ), Ally Malinenko, John Grochalski, Cat Conway, and others. Another "Trump" poem of mine, "Last Cigarette," appears over at Winedrunk Sidewalk. This site publishes a new poem every day about life under 45. Keep checking in for all kinds of voices speaking up and out. Finally, Lonesome October Lit (one of my favorite new online journals) has included my poem "The Incident at Choke Cherry Farm" in their big Halloween extravaganza yesterday, and I'm so happy to be part of it. Anyone who knows me knows I adore Halloween, so this is super cool. My deepest thanks goes to poet and editor Kate Garrett, who also selected my poem "Prayers from Dunwich" earlier this October.